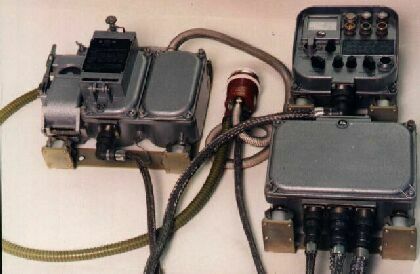 GO-27 NBC Recon Unit, produced by PZ Signal enterprise, Obninsk, is used on AFVs for detection, permanent monitoring, signalling, and directly controlling the actuators of NBC pressurization system in conditions of major burst of gamma radiation following a nuclear explosion, continuous gamma radiation from radioactive contamination, and presense of dangerous checical compounds in the air. Burst of gamma radiation that generates the exposure dose exceeding predefined threshold (event "A"). Persistent gamma radiation from radioactive contamination, generating exposure dose of 0.85 R/h and more (event "R"). Detection of chemical substances in the air in quantities exceeding predefined threshold (event "O"). This page is © 2006, Vasiliy Fofanov.